Over the past 3 years, phase 1 of relay baton project watermelon households have worked hard to improve their lives, and timely repaid the loan on time. This quarter, 16 new relay baton farmers launched the second relay baton project. The picture above is the site of launching ceremony attended by cooperatives director Chen Xiaohong, volunteer Wu Meinan and project households. The twelve new relay baton farmers joined the phase 2 of dragon fruit project. Together with the previous eight farmers, they jointly grew the high economic value of the red dragon fruit. Left photo above: The group photo of the new 12 project farmers, cooperatives director Huang Ruibiao and volunteer Zhu Jiangming at the launching ceremony. Right photo above: Project household Wei Junan is fertilizing. The 20 project households of phase 1 and 12 project households of phase 2 are pollinating, weeding, fertilizing, pest controlling, kiwi bagging and other work. On April 16, the cooperatives held a pollination technology training for the project households. The left photo above: Volunteer Guo went to the cooperatives to visit the project households. The right photo above: The cooperatives’ pollination training site for the project households. This quarter is the harvest period of tea, and the cooperatives has harvested 2000 tons of fresh tea leafs, selling 1200 tons, worth more than 50 million yuan. The left photo above: the site where cooperatives is paying two bonuses for project households. 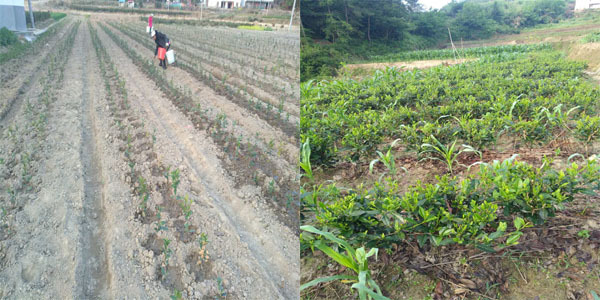 The right photo above: The project households are picking tea. On May 10, the cooperative organized project households attend a training on aquaculture technology. The left photo above: Project households are fishing. The right photo above: the cooperative issued sales money to the project households. In April when hawthorn trees were flowering, the project households were pruning the hawthorn trees，and fertilizing and irrigating. In May and June when the hawthorn trees entering fruit-setting stage, the project households were fertilizing the Hawthorn trees, and working on pest control, irrigation and other work. The left photo above: Project household Wang Jinsheng is spraying the medicine to prevent and control pests and diseases. The right photo above: Project household Ma Yanwen couple are constructing their new house. This quarter, 10 project households have the normal management of dendrobium such as weeding and fertilization. SSCLF-kailong Public Welfare Fund sent a group of people to study the cooperatives. The right photo above: Send technicians for the cooperatives to hold training for project households in La Xiang village, Jia Rong township and to distribute technical materials. The 20 Project households harvest wheat and transplant rice seedlings. On June 13, the cooperatives organized project households participate in the training on rice field management. The left photo above: the project household Zhang Jianming is transplanting rice seedlings with his family’s machine. The right photo above: The project household Jiang Fuming are transplanting rice seedlings artificially. The 20 project households are mainly fertilizing, watering and weeding. On April 25 the cooperatives organized project households to attend a technical training on arable land, and trees’ detail management. The left photo above: The training scene of project households. The right photo above: The project household Ou Guanhai’s wife, Xuan Xianji and Director Xuan are fertilizing. The project households in the garden are weeding, pruning fruit trees, controlling pest, and fertilizing, etc. On May 6, the cooperatives organized 20 project households and surrounding growers to visit the cooperatives base, learning and exchanging planting technology and management experience. The left photo above: the project household Chen Yuanlu is fertilizing the fruit trees. The right photo above: Project household Liu Ganfen’s newly built house. 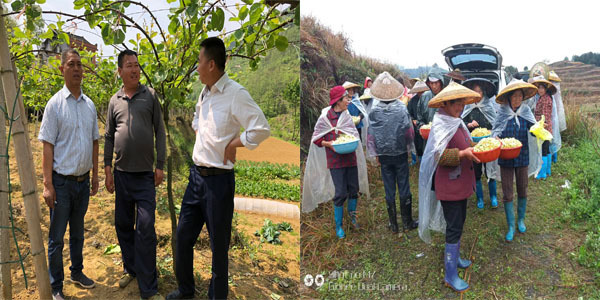 The left photo above: Volunteer Guo and his team visited the cooperatives on the afternoon of June 14, and exchanged ideas with project household Bai Xingqun’s father and project household Tian Ruijun. 20 Project households harvested wheat, cultivating rice seedlings and planting rice seedlings. The left photo above: farmers participated in the training. The right photo above: Breeding young ducks. The project households sell soybean, eggplant, sweet corn, cucumber and other summer vegetables, and the sales market is relatively good. The soybean price is kept 4-5.2 yuan/kg, higher than the same period last year. The photos above: Project household Yu Yunshu’s daughter Li Yang and project household Qiu Jingping’s daughter Qiu Yang are helping their parents to do the farm work. Left photo above: The scene of planting tea saplings in the tea garden. 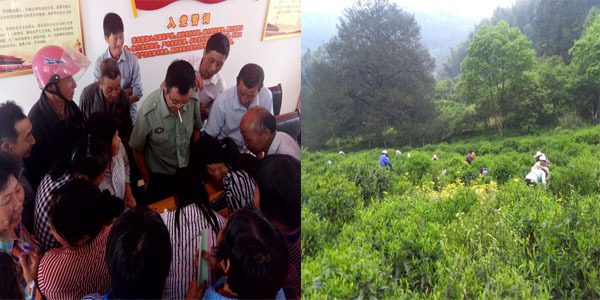 The right photo above: Project household Wang Xuezhong’s tea garden. The left photo above: The farm machinery competition scene where project household Yu Guowei, Han Longsheng participate in. The right photo above: The cooperatives organized project households to attend a training on applying for a tractor qualification certificate. On April 16, the cooperatives organized project households participate in tea-making training, including machine-made tea and hand-made tea. The left photo above: Tea plantation intercropping other crops. The right photo above: hand-made tea. The above photo: Project households Wu Pijin and Wu Junzhou are weeding and nursing hook Rattan. This quarter, the project households expand the woodland, increase the production of bamboo shoots by average 20% - 28%.